MIDI Touchpad transforms your MacBook Trackpad or Apple Magic Trackpad into a MIDI controller. With this tool you can record drum parts, add expression to solos, control different parameters of any virtual instrument, change track volume and panning during mixing, and much more. Outputs MIDI messages of any kind: Pitch Bend, Notes, Control Change, Aftertouch. Works with any DAW: GarageBand, Logic Pro, Cubase, Live, and others. Has 3 modes: Solo Pad, 8 Drum Pads, 4-channel Mixer. Supports multitouch and Force Touch (if a device has this capability). Changes MIDI channel dynamically with hotkeys (1-8). 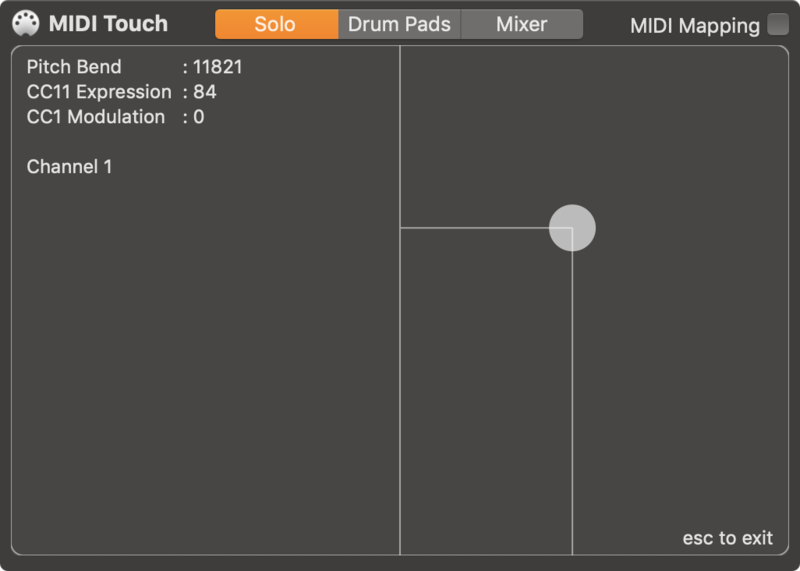 MIDI Touchpad creates a virtual MIDI port and takes control over your Trackpad when you click on the main window. This app outputs custom MIDI messages according to precise normalised touch positions of your fingers. MIDI Mapping preferences allows you to change all the MIDI output parameters, including Pitch Bend, Control Change, Aftertouch, and Notes. The application has 3 modes: Solo, Drum Pads, Mixer. Solo mode is an XY-Pad. In this mode, MIDI Touchpad outputs 3 MIDI messages simultaneously for X, Y, and Force. If a user touches the Trackpad with 2 fingers, application outputs other parameters (by default, Volume and Pan). Drum Pads mode splits the Trackpad into 8 zones and outputs NoteOn and NoteOff MIDI messages. You can customise Note Number and MIDI Channel for every zone. MIDI Mixer mode divides your Trackpad into 4 vertical sliders. You can map any MIDI Control Change Number and Channel to every slider. MIDI Touchpad processes touch data received from MacBook Trackpad or Apple Magic Trackpad and produces MIDI messages. This application does not collect any user data. MacBook and Magic Trackpad are trademarks of Apple Inc., registered in the U.S. and other countries. MIDI is a trademark of MIDI Manufacturers Association (MMA). © 2019 Andrei Bundin. All Rights Reserved.